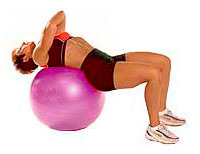 Lie face up with Swiss Exercise Ball under hips, low back and mid back. With feet on floor, bend legs to 90 degrees and align knees over ankles. Cross arms over chest, hands to opposite shoulders. 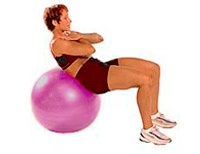 Move ribcage to pelvis as you lift mid back off ball. Low back and hips remain touching the ball. Release and repeat.